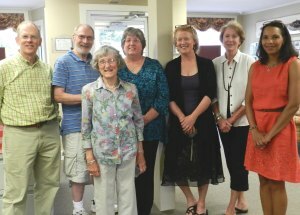 The opening art exhibit reception at the Newcastle Square Realty Associates in Damariscotta, was well attended on Thursday, July 19. The show highlights the work of Holly Berry’s students who are learning the many techniques of relief printmaking. Every Thursday the students meet for a three hour Linoleum Block printing workshop at the Midcoast Printmakers, Inc. studio at the Round Top/DRA Farm on Bus. Rt 1 in Damariscotta. At the sessions, each artist works at his or her own pace on self-directed projects. The artwork can be viewed at Newcastle Square until August 18, 9-5 daily and Saturday mornings from 9 to 1 PM. The Midcoast Printmakers offer many classes using various methods of printmaking using a printing press or other ways of transferring images to paper. For more information on classes offered e-mail midcoastprintmakersinc@gmail.com. Come for a one-day workshop or stay for a continuing series.